If selling prowess relies solely on talent, nobody would bother buying a self-help book on sales. You can buy one but will just burn yourself out trying to follow the author’s success mantra — without ever seeing a hint of the promised results. Thankfully, selling success depends more on training than talent. The multibillion-dollar self-help industry is proof of that. But before you think that nurturing existing habits is all you need, STOP. Indeed, so much depends on habits. But in sales, you have to break them as much as build them. Why? Most human habits tend to follow the path of the least resistance. (If you’re a morning person, for example, it’s easier to fall into the habit of delivering your best output during the early hours of the day. Otherwise, you’d be so cranky and exhausted trying to do the same thing late at night.) In contrast, the selling dynamic entails breaching your prospect’s substantial buying resistance. Simply put, natural human habits avoid conflict; winning sales habits actively seek it. If you find that hard to believe, just ask sales professionals who excel in the field. Pipedrive co-founder Timo Rein, for example, has more than 10 years of remarkable selling performance valued at millions of dollars. In his e-book, Sales Pipeline Academy, Timo recounted a pivotal experience that turned his career around — and it primarily involved developing unnatural habits. Early in his career, Timo went door to door selling educational books for Southwestern Advantage. Being a rookie, Timo encountered rejection so frequently that he lost count, with some prospects physically slamming the door in his face before he could even pitch. In his field work, Timo began to discern a pattern among his clients wherein one type could be classified as friendly but unlikely to buy. The other type covers prospects who are likely to be rude or uninterested but offering a much higher likelihood of making a purchase. Timo could choose to have a good time chatting with friendlier prospects and clock in a mediocre sales performance. Or he could expose himself to a lot of stress and rejection but bring home a much higher number of closed deals. He wrestled with the dilemma and finally decided to go against his nature and embrace pain. Accomplished sales professionals such as Timo will never tell you that selling is easy. On the contrary, successful practitioners almost always say that you need to alter elements of your behavior to deliver high performance. Resisting change and relying on your default mode can be disastrous if you’re bent on treading a sales career. Blame the stingy client, your overbearing boss or the lousy product for lost deals. People are analytical creatures but not everyone has the acumen for self-analysis. Our DNA has also been hardwired for self preservation, which rarely induces us to blame ourselves for foul-ups. How to counter: Own responsibility for selling outcomes. This is the first step that will set your career in the right direction. Quit the blame game. Instead, alter your approach or act constructively in cases where the client appears unreasonably thrifty, your boss behaves like a bully or the product you’re selling has crappy features. Talk about yourself. Confidence will take you places but talking about yourself all the time misses the point of selling entirely. Sales is about creating value for customers. Unless the client wishes to know more about your credentials, resist the urge to use your bragging rights. How to counter: a) Focus on the client. b) Listen well. c) Ask relevant questions that probe deeper into their needs or the nature of their problem. d) Genuinely care about others. Stay in your comfort zone as often as possible. After a grueling meeting, who wouldn’t want to relax in the cafe and catch some of their favorite fare on Netflix? At the same time, who can really enjoy feeling like an automaton being notified by the CRM to follow up on a uninterested prospect? How to counter: Make discomfort your comfort zone. This is easier said than done, of course, but you can start overhauling your behavior simply by loving what you do. If you’ve made up your mind to to be a salesperson, you should also train your heart to love the things that will help you become a great one. Things like process, schedule, targets, goals, analytics and discipline rarely evoke heartwarming emotions but getting to like them will help you enjoy an otherwise uncomfortable ride. Run away from fear, anxiety and stress. In Game of Thrones, horses and dragons have one fundamental difference when it comes to steering them in the direction you want: Horses move away from where its rider applied pressure while dragons rush toward the direction where pressure is strongest. In sales, you need not charge into volatile situations but you should neither fear nor run away from them cluelessly, either. Had Timo Rein decided to go easy on his personal feelings and just concentrated on friendly customers, he wouldn’t have become successful in the field. How to counter: Be a dragon. You can do that by a) intimately knowing your product and its market; b) preparing for any sales engagement scenarios; c) welcoming customer complaints and doubts; and d) treating rejection as part of a continuing improvement process. Take it easy/Adopt a carefree approach. It’s good to feel relaxed on the job. Having a calm mind helps you focus and think creatively. But this doesn’t give anyone the license to be lax. According to the National Sales Association, only 2% of sales occur during the initial engagement. So, 98% happen down the line across weeks, even months. If sales reps were less diligent after the first encounter, they would have missed subsequent opportunities to build trust and close deals. How to counter: Stay vigilant. Prime your process to find, identify and catch opportunities. Take notes about customer problems, matching needs with product or service features. Revisit prior engagements to give relevant updates that just might tilt past prospects toward conversion. Call it quits when the going gets rough. Selling is a tough field. Depending on the industry and selling channel, sales conversion rates vary wildly, with success in B2B sales pegged between 2% and 10%, according to MarketingSherpa. That means you get one nod for every 10 engaged prospects in the best case scenario. What if this nod were suppose to occur at your 10th attempt, with the first nine bitter rejections having already sapped your will to continue? And what if you weren’t selling in the best of times (which means you might need to engage 20 prospects — not 10 — just to close one deal)? Now you see why not everyone becomes a sales superstar. How to counter: Develop the old-school virtues of persistence, resilience and tenacity. Wait for tomorrow to turn the tide/Let luck run its course. There’s a lot of waiting in the world of selling. But passively waiting for a desired outcome to occur shouldn’t be one of them. How to counter: While waiting, pack your pipeline to its fullest. Never stop prospecting. Your star client might be on vacation, and you’ve just did a demo for the next best. Unless you’ve previously planned for a vacation, it wouldn’t hurt to follow up on existing prospects and find new ones. Stick with the people, tools and techniques you are used to. We feel safe around familiar surroundings and people. Being around them isn’t that bad, unless you are an extreme adventurer. But being too content has its drawbacks. Staying put blunts ambition and retards growth. How to counter: Explore. Stay curious. Try new things. Staying put defeats the concept of who ideal sales professionals should be: people-centered folks who probe and solve human problems in shifting environments, guiding decision makers to make the right purchase. To improve your craft, engage peers and mentors who offer fresh ideas, and try out smart technologies that make your job easier or more fun. Behavioral change is a common theme not only in sales-oriented literature but arguably in the entire spectrum of self-help culture. That’s because modifying our attitudes and how we react to different situations is often much easier than changing the external factors that have created the situations in the first place. Learn to master your sales conversations with this 25 page ebook. 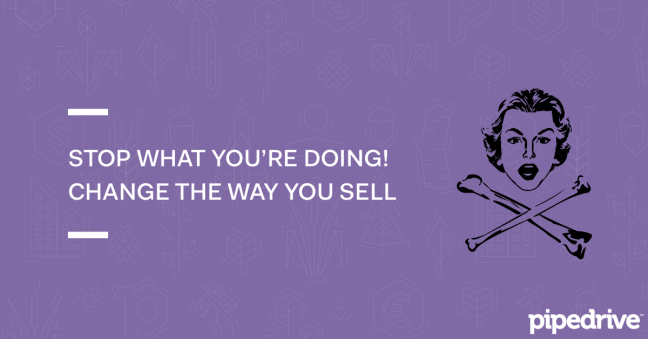 Expect expert advice to help you level-up your soft skills and pump up your conversion rates.